Here are a couple of shots of the trail head. This was the only snow encountered on the ride. The weather was beautiful last night. Temps around 70 to start and around 67 at the end. No humidity and only a few mosquitoes out. It was a much better ride than last week. There was some therapeutic mud out there for the women to get jealous of but not enough to float a bike. (remember Townsend a few years back?) TiTim didn’t have his dirty booties on. I figured he must have washed them and was embarrassed about it since he LOVES Dirty Booties. Now he’s wearing a bootie on his head, a DoRag of sorts. Killer, Dude. HOOPS! Gringo is still getting off his bike on the occasional hill which i am getting used to. I think he was tired from his drinking (I mean riding) last night with the Slaphead MoFo’s. If you ride with the MoFo’s never mind bringing your camelback…Make it a full size camping backpack please. Someone has to carry the multiple Wachusetts Beer Growler!! 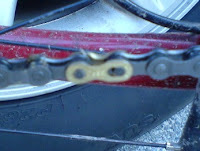 Geo got a new chain and quicklink finally. It only took him all of last year to open his wallet and finally let the moths go free to break down and buy a new chain. It looks and works great. Although now my drivetrain is doing some jumping and thumping. Have to take a look at that this weekend and I was told to “clean out all the leaves in the gears and maybe it would run better” by someone in the group. A Nameless member. Also Geo didn’t pass me last night so I may have gotten some wind in my sails finally. No crashes or injuries which means there was Zero entertainment value to last night’s ride!! Just riding and chatting. A ride must have blood gushing down a leg or arm in order for it to have this so-called entertainment value. I did manage to break up the monotony of the ride by finally doing a 4 foot drop off a horse jump. I never did that one before. I had to watch Gringo do it first and then apparently I didn’t go fast enough for gringo’s tastes as i dropped off the edge. I landed nice and on both wheels. No squirreliness. Gringo…relax. That is why my bike says EXPERT. I let it carry me through even when my brain doesn’t function properly. Now for the post-ride festivities which is where the title of this posting comes in. We did some Venting after the ride. We tried the new Coors Light vented wide mouth cans. Excellent idea that works great. The only way they can get this cheap “water” down your throat any faster is if they have a little pop-top on the bottom of the can (i.e. funnel effect). Highly recommend them. Now if they could get the Banquet to come in these cans, we will be all set.